*Note- You have to place an order of minimum US$60.00 for free delivery. 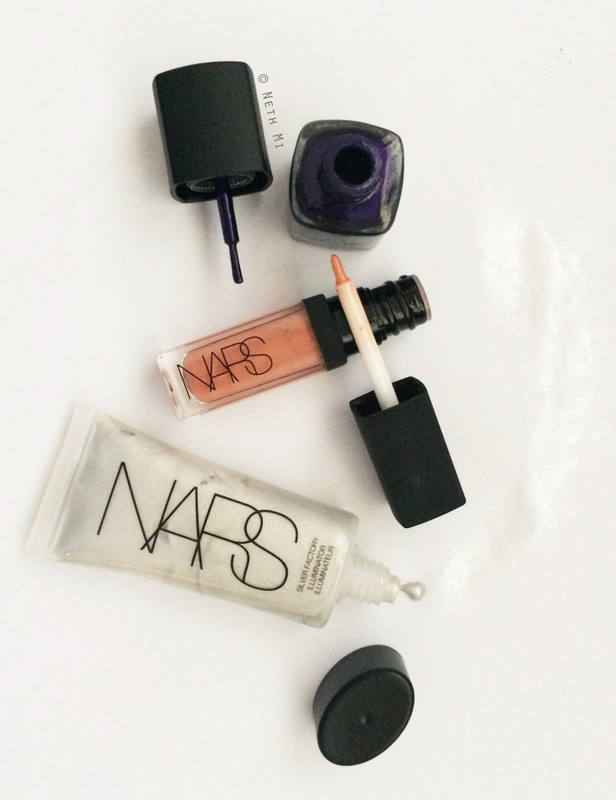 In this case, I ordered another product from Nars to meet this requirement. 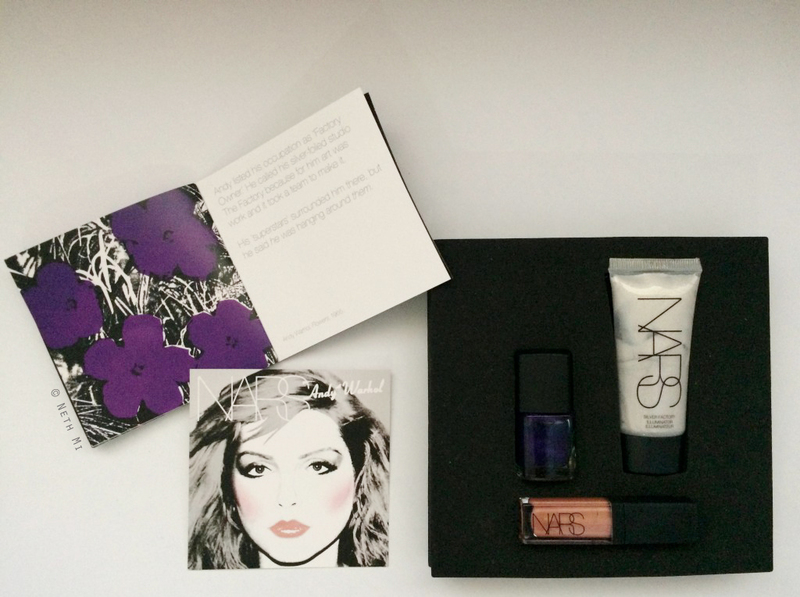 There’s also a small booklet of selected Andy Warhol’s art with mini descriptions and another small card with instructions on how to achieve the “Silver Factory Look” using these three items as key products with a few other Nars products from their permanent line. 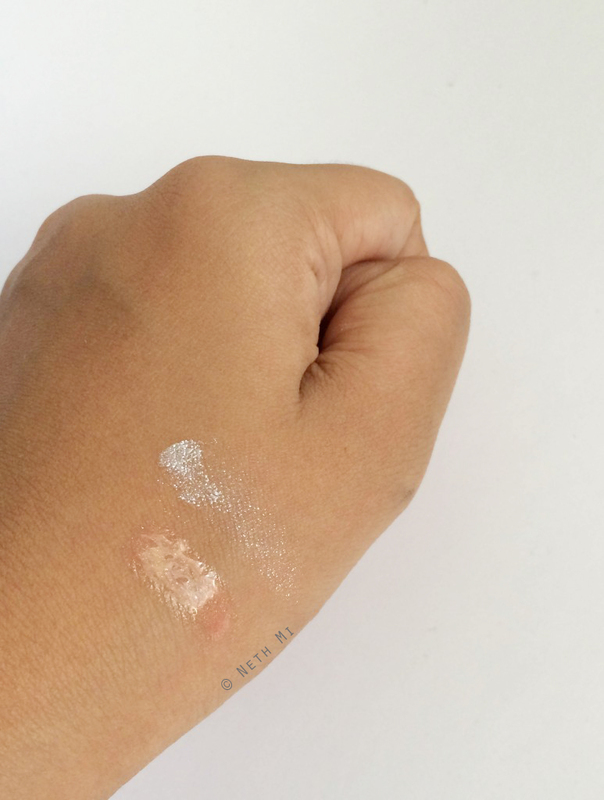 This illuminator stays true to the name… it’s so darn silver and you have to be extremely careful to use this one. I would prefer not to put this directly on to the face as this brings too much sparkle on to the cheekbones. The silver particles in this are quite visible, but with careful application you can achieve a beautiful iridescent glow. First I applied a tiny bit (the tiniest bit you could imagine) on to the back of my hand and picked it ever so carefully with my ring finger. Then I lightly patted my finger on to the cheekbones. So overall, I love this product. I generally choose lip glosses over lipsticks because they’re so easy to use and you need less preparation to apply… However, I’m a little disappointed over this one because it felt quite sticky and heavy, and started pulling the skin off my lips. I loved the golden shimmer on top of the peachy colour, but don’t we always want our glosses to be extremely light, so that it doesn’t feel like we’re wearing lipgloss at all?? I’d give 5 stars for the packaging though… I always love NARS’ minimalistic packaging… this is super easy to carry even in the smallest evening clutch you have, so I guess it’s not completely useless… But I think I would use this more during night-outs because it’s sooooooo glossy. Just make sure you prep your lips before application! Ok, this colour is just AMAZING. 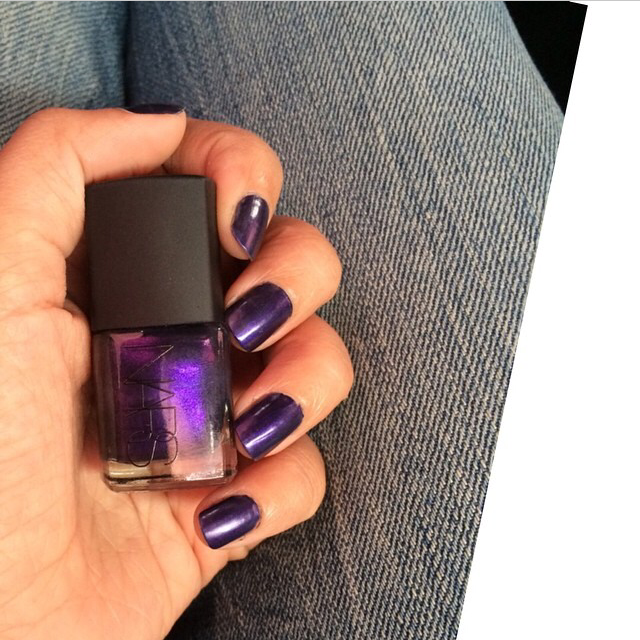 It’s a beautiful deep violet that changes colour according to the light. This is a shimmery polish but the shimmer particles are so tiny it’s hard to say what colour they are. In low light this looks like a blackish indigo and in the direct light it gives out the most prettiest violet shade with a beautiful low sheen. You can apply this in one coat if you keep a steady, fast hand but otherwise I would recommend two coats. But make sure you do a proper mani pedi with this as this is a blue-based polish and therefore it takes time to completely remove this off your nails if you make a mistake. (your nails will remain sickly blue if you don’t clean up properly! And it’s wise to use a base coat before application 😉 Also make sure a top coat is applied for more durability. So, is this gift set worth buying? I would say yes! For that price, it’s definitely worth it! I love the fact that all of these are mini products and they fit any cosmetic pouch or even an evening clutch pretty easily. All 3 products have good pigmentation/colour that lasted longer than an average product, plus they look super cool in Fall!! !